Monorail is a train which utilizes a single track, made of either metal or concrete. The monorail is guided and supported by wheels mounted beneath the train, which are continuously in contact with the track. Generally, monorails are powered by electricity provided through a third rail mounted along the track. The maglev type of monorail is powered by magnetic lavation and utilizes two sets of magnets, one is for raising the vehicle above the track and the other to propel the vehicle. Monorail trains generally have three or four cars and can have up to eight cars. Monorails trains are wider than the track; hence requires minimum space. Trains are a minimal polluting mode of transportation and hence, governing bodies are enhancing train transportation in order to limit the pollution emitted by different modes of transportation. Governing bodies of several nations are focused on the incorporation of less or zero emission modes of transportation in order to meet the Paris Climate Accord, which pledges to keep the global temperature rise within 2 degree Celsius in the near future, which has been signed by 195 nations. Such government policies and agreements signed at the global level are propelling the demand for trains across the globe. Monorail is a faster and safer mode of transportation. The rate of accidents for monorails is significantly lower than that of other types of train. The cost of per kilometer construction for monorail is marginally lower than that of other rapid urban transits such as metro and bullet train. The space required for monorail is significantly lower and it is easy to construct. Consequently, monorails are suitable for densely populated and congested areas. Monorails are suitable for traveling over short distances; therefore, governing bodies are preferring for them for urban rapid transits. All the aforementioned qualities of monorails are fueling the global monorail system market. A key restraint of the global monorail system market is its lower passenger carrying capacity. The number of passengers that can travel on monorails is significantly lower than that of other rapid urban transits, as monorails are generally capable of carrying three to four cars, sometimes up to eight cars. Therefore, governing bodies prefer metro and other rapid transit systems over monorail systems. Straddle type of monorails are capable of carrying more number of passengers than that of suspended type of monorails. Thus, the straddle monorail segment accounted for a major share of the market, in terms of revenue, in 2017. Suspended monorails are suitable for theme parks, zoos, and other small places where the number of passengers is limited. Straddle type monorails are suitable for crowded areas and for high frequency and hence, these monorail systems are preferred for urban areas. Maglev monorails are capable of running at speeds above 500 kilometer per hour, while electric monorails have speeds in range of 80 to 100 kilometers per hour; however, the cost and required time of construction for electric monorails is considerably lower than that of maglev monorails. Therefore, demand for electric monorails is high across the globe. Maglev monorails are not suitable for short distance travel, such as within urban areas, thus electric monorail systems are being preferred for intra-city transportation. Consequently, the electric monorail segment held a notable share of the market, in terms of revenue, in 2017. Automation is changing the face of automotive and transportation industries considerably. Raised level of automation has proven to be effective in reducing the number of accidents, number of crashes, and effectively reducing delays. Considering passenger safety and reduced expenditure over longer halt time, governing bodies are preferring to incorporate at least some degree of automation in under-construction and proposed monorail system projects. Therefore, semi-autonomous and completely autonomous segments are likely to expand significantly during the forecast period. Based on number and type of automated components in a train, the grade of automation is decided. Completely autonomous trains are considered as driverless and unattended trains. In GoA3 and GoA4 trains, all operations are performed automatically. GoA3 and GoA4 monorails are considered to possess considerably high levels of safety and punctuality and hence, mass transits are being incorporated with GoA3 and GoA4 technology. GoA2 is being widely preferred across the globe owing to its effectiveness in reducing accidents and enhancing the overall train performance. In a GoA2 trains, Automatic Train Operation (ATO) and Automatic Train Protection (ATP) are incorporated and operated under surveillance of the driver, as well as the train cruising and stopping are performed automatically, which reduces the chances of accidents and crashes and enhances the safety of passengers. GoA2 trains provide numerous benefits, in terms of cost of installation, and hence, are being adopted widely. Thus, the segment is likely to expand at a notable pace during the forecast period. Large number of under-construction and proposed monorail system projects are based in Asia Pacific, especially China, India, and ASEAN countries, which have a large population and comprise of densely populate areas, which in turn drives the demand for monorail systems. Rapidly occurring urbanization, increase in number of daily commuters, increased road traffic congestion, and availability of small spaces are prompting governing bodies to prefer monorail systems. 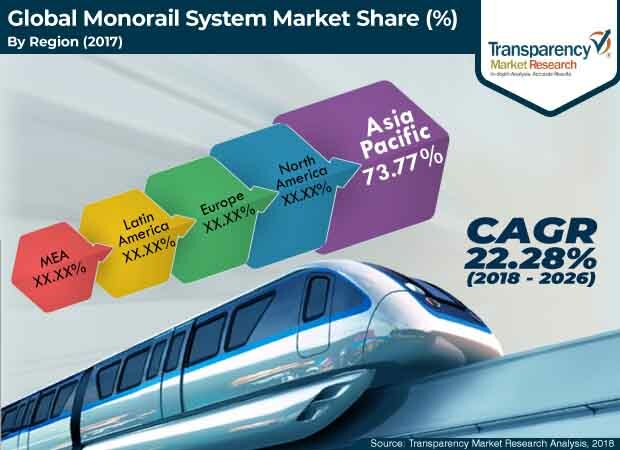 Therefore, Asia Pacific is likely to offer lucrative opportunities to the monorail system manufacturers as the region has a large number of proposed monorail system projects. Middle East & Africa and Latin America are witnessing a surge in urbanization. Enhanced education quality, increased per capita income, increased job opportunities, and increase in number of daily commuters across the aforementioned regions are fueling the demand for fast, secure, and economical mode of transportation, which in turn is fueling the demand for monorail system in these regions. Key players operating in the global monorail system market are CRRC Corporation Limited, Bombardier Corporation, Hitachi Rail, BYD Company ltd, Ansaldo STS, Alstom S.A., SIEMENS AG, Thales Group, Mitsubishi Electric, General Electric, and ABB. BYD Company ltd. is a subsidiary of leading electric vehicle manufacturer BYD Auto, which is focused on the development of advanced low and zero-emission modes of transportation.